I am in sweet heaven. 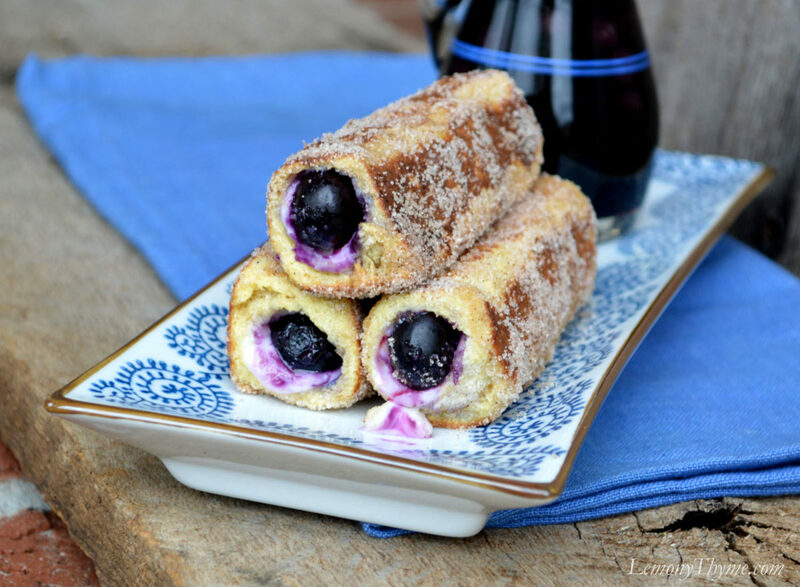 Blueberry Cream Cheese French Toast Roll-Ups are like a cheese Danish, cinnamon roll, blueberry syrup lovefest. I sweetened the softened cream cheese with a little sugar, vanilla, and almond extract. For the blueberry syrup I simmered pure maple syrup with a handful of blueberries. The French toast roll-ups are pan browned then rolled in cinnamon sugar. Lovefest I tell you. I’m already dreaming of the next batch of French Toast Roll-Ups. Perhaps a savory filling is in order. Ah the choices. In a small bowl, combine cream cheese, sugar, vanilla, and almond extract. Spread ¼ of mixture on half of each of the bread slices. Place a row of blueberries across the lower edge of each roll-up; roll tightly. Combine sugar and cinnamon in small dish. Beat egg and milk in separate shallow dish. Dip each roll-up in egg mixture. Heat 1 Tbl. butter in a skillet over medium heat. Cook roll-ups in skillet turning until browned on all sides. Remove from skillet and roll in cinnamon/sugar. Serve immediately. In a small skillet warm maple syrup with ½ cup blueberries.